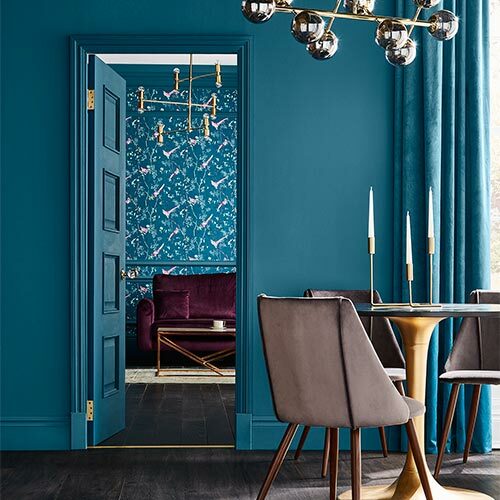 Jungle inspired design perfectly synchronises with Pantone’s Colour of the Year Greenery, giving a spotlight to fresh shades that you may not have thought to use within your home. 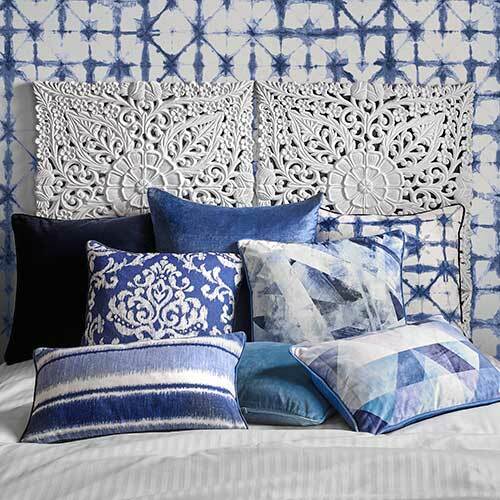 This year we’ve curated multiple collections that take on this trend from unique angles, each incorporating elements inspired by nature as well as colour palettes taken from the catwalk. 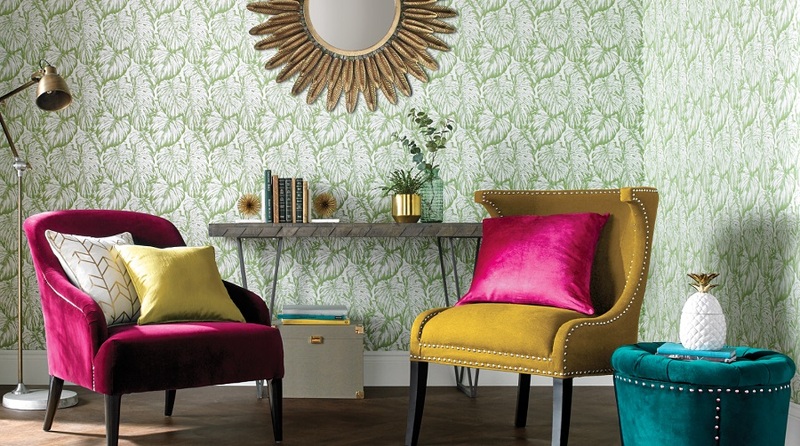 Starting with Julien Macdonald’s Honolulu wallpaper; this collection was certainly created ahead of its time, using Julien’s forward & fashion thinking mind. 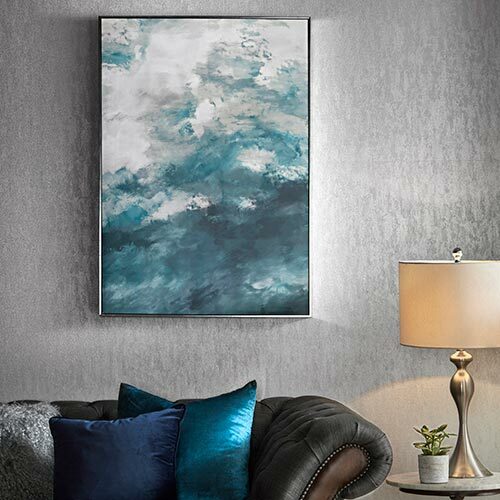 Incorporating his signature use of glitter, Honolulu features a supercharged Palm Tree design that adds instant energy on to your walls. Leading with a stylish white and green colourway that has gone on to become one of our best-selling wallpapers of the last few seasons – with no sign of slowing down any time soon. Moving through to Tropical Leaves which was inspired by the unique lines of Cheese Leaf. 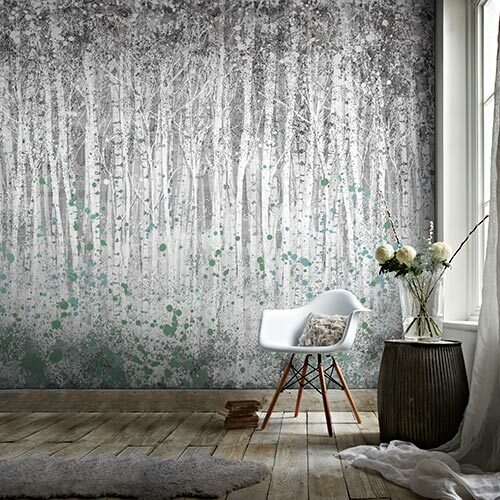 This design was born from our Savage Beauty trend and really delves in to the lushness of the jungle; with a full design using a fibrous background with metallic upper to add a glamorous twist to this style. 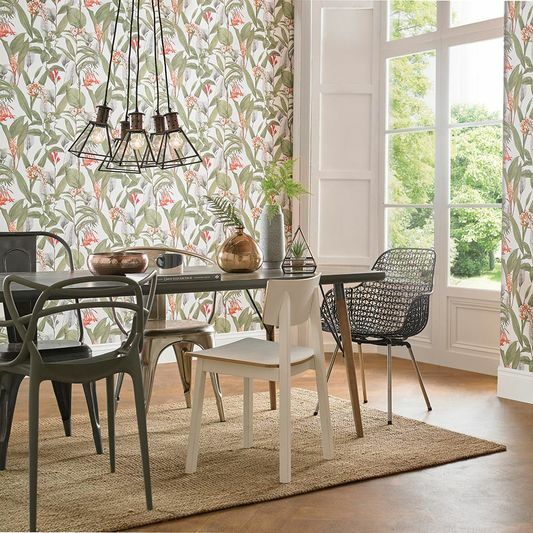 Our Botanical collection continues to add vibrancy to the Tropical trend but with a more horticultural finish within this wallpaper. Inspired by Charles Darwin, a 19th century botanist, this collection was built to capture the essence of sustainable living. Our designers chose this hand-drawn print from our art archives and applied a fashion forward colour palette to the 6 wallpapers within the collection. 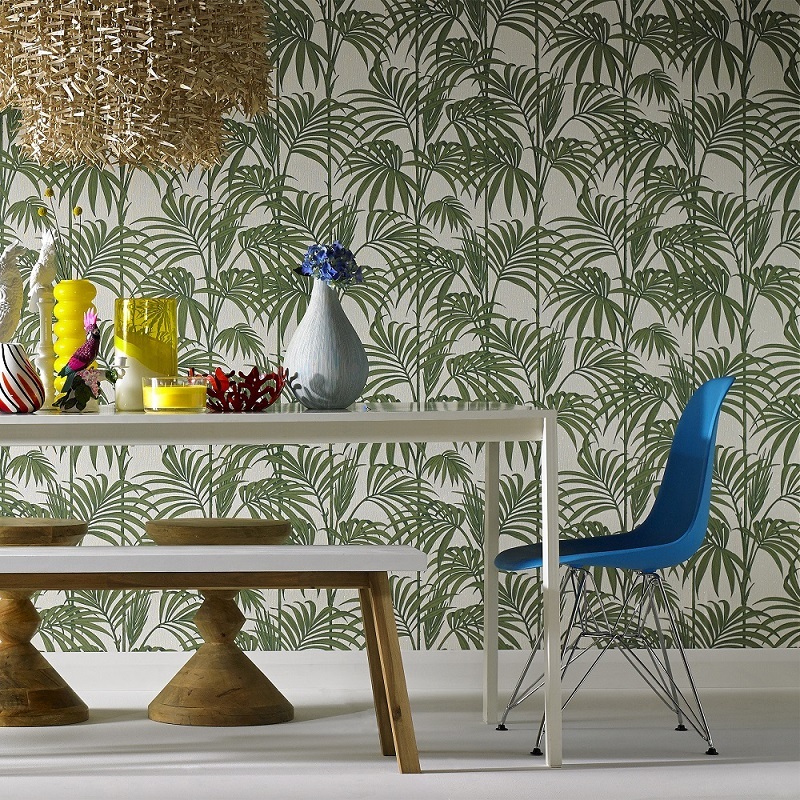 Adding a Wall Mural to your home is a simple & effective way to add a touch of tropical on to your walls. 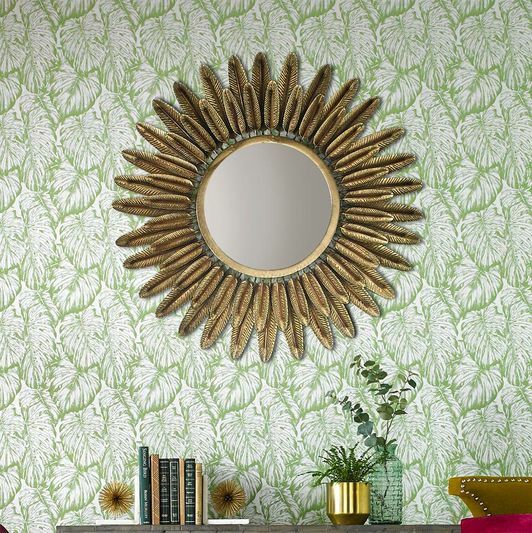 We have a couple of different styles to suit how you want to style your home; our Couture Jungle Floral mural features an overgrown and wild palm leaf design spotlighted with Havana style florals for a touch of paradise to this design. 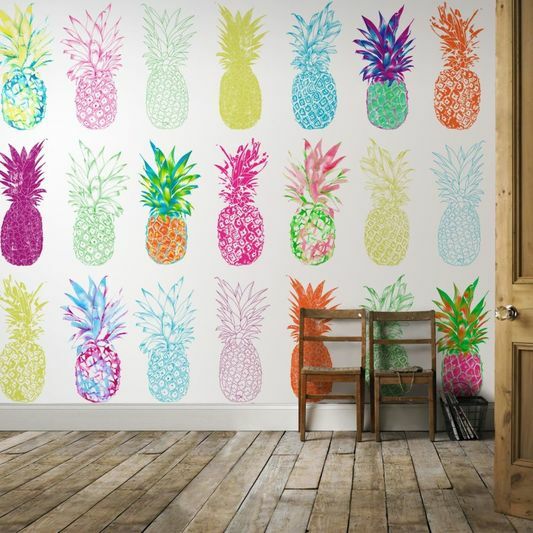 We also have our Pineapple Craze Mural featuring a high-voltage pineapple fruit repeat in an array of summer inspired shades to add energetic vibes on to your wall. If you’re not feeling confident to add the Tropical trend on to your walls, then dropping in an arrangement of home accessories is an easy way to update your décor; equally these will add finishing touches if you’ve chosen to follow this trend throughout your interiors. Wood element, laidback metallics and earthy tones make up our tropical accessories. 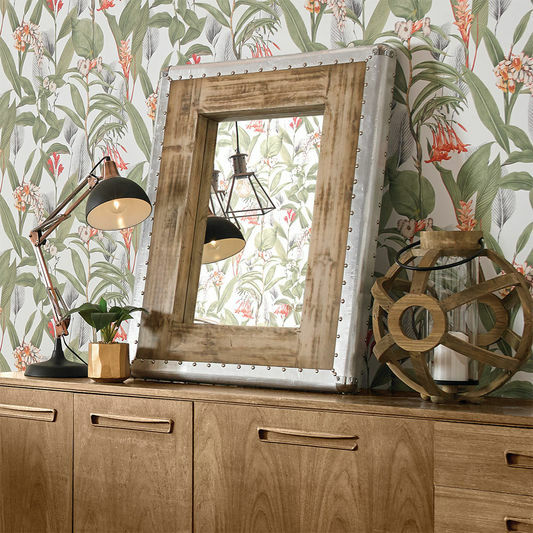 From our Botanical collection, you can see we’ve added a chunky, Industrial Metal Trimmed Mirror and Botanical Wooden Large Lantern to add to the Sustainable Living trend that this collection embodies. Within our Tropical Leaves collection, the accessories become less abstract to the trend; featuring a Feather Fringed Gold mirror perfect for complimenting your new paradise as well as a Tropical Leaves Gold Metallic Cushion to carry this trend through to your furnishings. There are so many different ways to work the Tropical Trend in to your home but we can be sure that you won’t regret adding in touches of the wild to suit your style.